Christian Marazzi is Professor and Director of Socio-Economic Research at the Scuola Universitaria della Svizzera Italiana. 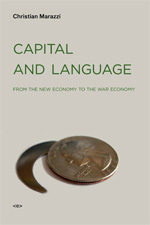 He is the author of Capital and Language: From the New Economy to the War Economy (Semiotext(e), 2008). The crisis of contemporary financial capitalism requires that we question the limits of the linguistic nature of money, the structural contradictions of an economic-financial system in which the performativity itself of the monetary-communicative strategy comes into play. Communication as work: we have recently experienced a profound transformation in the processes of production. While the assembly line (invented by Henry Ford at the beginning of the last century) excluded any form of linguistic productivity, today, there is no production without communication. The new technologies are linguistic machines. This revolution has produced a new kind of worker who is not a specialist but is versatile and infinitely adaptable. If standardized mass production was dominant in the past, today we produce an array of different goods corresponding to specific consumer niches. This is the post-Fordist model described by Christian Marazzi in Capital and Affects (first published in 1994 as Il posto dei calzini [The place for the socks]). Tracing the development of this new model of labor from Toyota plants in Japan to the most recent innovations, Marazzi’s critique goes beyond political economy to encompass issues related to social life, political engagement, democratic institutions, interpersonal relations, and the role of language in liberal democracies. 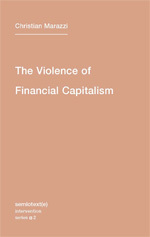 This first English-language edition of Christian Marazzi’s most recent book, The Violence of Financial Capitalism, makes a groundbreaking work on the global financial crisis available to a new audience of readers. 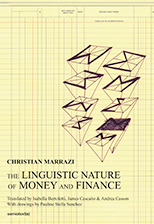 Marazzi, a leading figure in the European postfordist movement, first takes a broad look at the nature of the crisis and then provides the theoretical tools necessary to comprehend capitalism today, offering an innovative analysis of financialization in the context of postfordist cognitive capitalism. He argues that the processes of financialization are not simply irregularities between the traditional categories of wages, rent, and profit, but rather a new type of accumulation adapted to the processes of social and cognitive production today. The financial crisis, he contends, is a fundamental component of contemporary accumulation and not a classic lack of economic growth. The Swiss-Italian economist Christian Marazzi is one of the core theorists of the Italian postfordist movement, along with Antonio Negri, Paolo Virno, and Bifo (Franco Berardi). 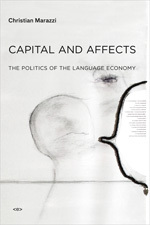 But although his work is often cited by scholars (particularly by those in the field of “Cognitive Capitalism”), his writing has never appeared in English. This translation of his most recent work, Capital and Language (published in Italian in 2002), finally makes Marazzi’s work available to an English-speaking audience. Most of the writers who contributed to the issue were locked up at the time in Italian jails…. I was trying to draw the attention of the American Left, which still believed in Eurocommunism, to the fate of Autonomia. The survival of the last politically creative movement in the West was at stake, but no one in the United States seemed to realize that, or be willing to listen. 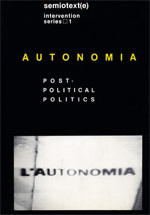 Put together as events in Italy were unfolding, the Autonomia issue—which has no equivalent in Italy, or anywhere for that matter—arrived too late, but it remains an energizing account of a movement that disappeared without bearing a trace, but with a big future still ahead of it.